Byrd’s girlfriend had rented a Ford Fusion. Byrd was not on the rental agreement with the car rental company. Bird was driving the Ford Fusion on Interstate 81 near Harrisburg Pennsylvania. Pennsylvania state troopers pulled over the Ford Fusion that was being driven by Byrd after he passed a slow-moving truck and was too slow to pull into the right lane. Police discovered that there was an arrest warrant for Byrd out of New Jersey and that he had a criminal record. They ask Byrd for his consent to search the vehicle and he declined to give his consent. The police then discovered that Byrd was not on the rental agreement and decided that they did not need his consent to search his car because he was not on the rental agreement. The police search the car and discovered the heroin and the illegal body armor in the trunk of the car and place Byrd under arrest. While the Supreme Court ruled in Byrd’s favor, his case is not over. The Supreme Court returned the case to the trial court to consider other legal arguments raised by the prosecution, including that Byrd had his girlfriend rent the car in her name even though he was intending to be the one who was going to drive the car. The case is Byrd v. United States, 16-371. The next case involves the triple-murder conviction and subsequent death penalty sentence of Robert McCoy in Louisiana. McCoy was charged with the 2008 triple murder of the mother, stepfather, and son of his ex-wife. There was substantial evidence that McCoy was guilty of the murders. His family hired attorney Larry English to represent him in the murder case. McCoy insisted that he was innocent of the murders from day one. However English employed a different strategy. He believed that if he admitted that McCoy was guilty, he would be able to avoid the death penalty for his client. During the course of the trial, English made several statements to the jury which indicated that McCoy was guilty even though McCoy insisted that he was innocent. McCoy was eventually convicted of the triple murders. His lawyer’s strategy did not succeed because McCoy was sentenced to death. McCoy appealed his conviction on the basis that his lawyer admitted his guilt without his approval. 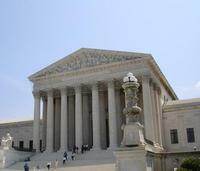 The Supreme Court agreed with McCoy and remanded his case back to the trial court for a new trial. In the majority opinion, Justice Ginsburg wrote that “we hold that a defendant has the right to insist that counsel refrain from admitting guilt, even when counsel’s experience-based view is that confessing guilt offers the defendant the best chance to avoid the death penalty.” Justice Ginsburg further found that Mr. English’s disloyalty to his client required that McCoy get a new trial. The case is McCoy v. Louisiana, 16-8255. James Dimeas is a nationally-recognized, award-winning, criminal defense attorney. Recently, the American Society of Legal Advocates named James Dimeas a “Top 100 Criminal Defense Lawyer In the State of Illinois For the Year 2018.” James Dimeas has been named a “Best Criminal Defense Lawyer in Chicago” by Expertise and a “Best DUI Attorney.” The American Institute of Criminal Law Attorneys have named James Dimeas a “10 Best Attorney for Client Satisfaction.” The National Trial Lawyers have named James Dimeas a “Top 100 Criminal Defense Trial Lawyer.” AVVO rates James Dimeas as “Superb”, the highest rating possible for any criminal defense lawyer in the United States. If your are facing criminal charges, you can contact James Dimeas anytime for a free and confidential consultation. You can always talk to James Dimeas by calling him at 847-807-7405. Byrd v. United States, 16-371. Does My Lawyer Have to Give Me Copies of the Police Reports for my Case?, by James G. Dimeas, Chicago Criminal Lawyer Blog, March 13, 2018. When Can the Police Search My Car?, by James G. Dimeas, Chicago Criminal Lawyer Blog, February 21, 2018.